This recipe showed up in my Facebook feed from Food & Wine recently as part of a Moroccan menu. It appealed to me for many reasons – I love Moroccan food, it has fruit and nuts in it, and it stated that it’s not too sweet. It did not disappoint! The recipe suggested to serve these with whipped cream, but we thought they were great without. After seeing Margaux’s comments about the honey whipped cream, we’ll try them that way next time. As with many sweets, this was great in the morning with a cup of coffee or tea. Moroccan mint tea would make it really authentic. I made these for a Sunday dinner dessert, and they were delicious! I served them topped with honey-whipped cream, and drizzled with honey, to give them a little extra sweetness. But I think that they are much better suited to brunch or breakfast. I can’t wait to eat the one we have left over for breakfast with a cup of coffee!! 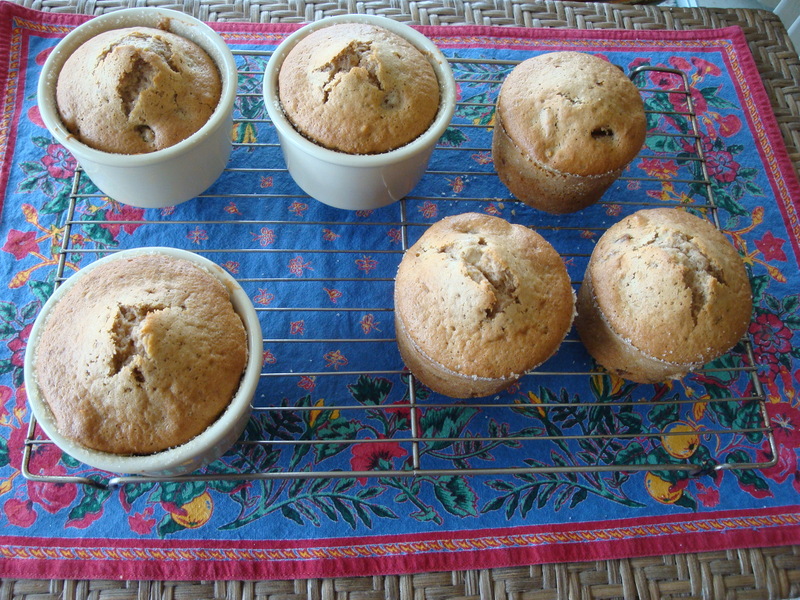 I think they could also be baked in a muffin pan, if you don’t have ramekins. However, I wouldn’t use paper muffin cups for fear that a lot of cake would be left behind on the paper when unwrapping them. Just do the same process of buttering and sugaring the muffin tin, and it should work just fine. Mine took less than the 30 minutes to bake…I checked at 25 minutes and they were done. I possibly could have taken them out at 23 or 24 minutes even. To make the honey whipped cream, just whip 1 cup of heavy cream with an electric mixer on high speed, adding honey as you’re beating, to your desired sweetness. I added about 1 tablespoon of honey, but you may want it to be sweeter, especially if you’re serving the cakes for dessert. Preheat the oven to 350°. Butter and sugar six 1-cup ramekins. In a small bowl, whisk the flour with the baking powder, cinnamon and salt. In a large bowl, whisk the egg yolks with the confectioners’ sugar until dissolved. Stir in the dates, walnuts and oil, then stir in the dry ingredients. I’m including a photo of what the “batter” looks like at this stage – don’t be daunted by how stiff it is. In a large stainless steel bowl, beat the egg whites to firm peaks. 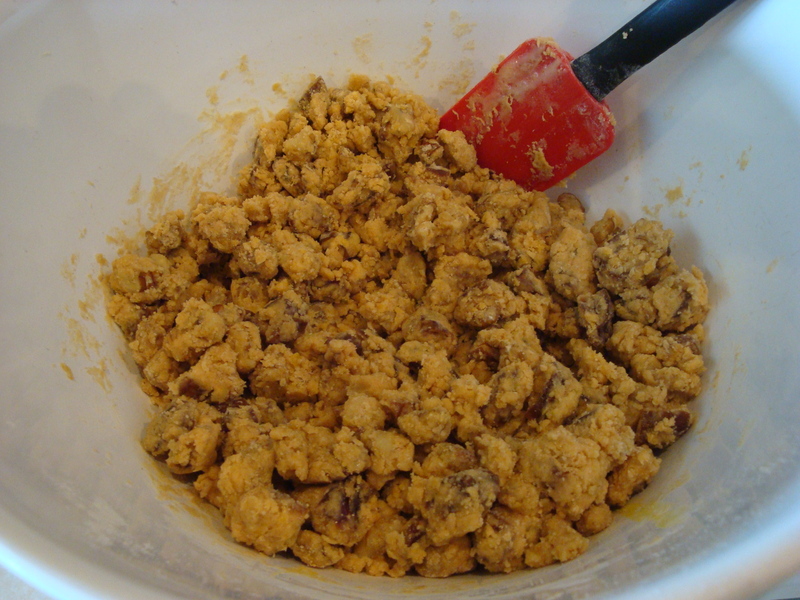 Stir one-third of the whites into the batter to loosen it, then fold in another third of the whites until incorporated. This takes some muscle!! Lastly, gently fold in the remaining whites until just a few white streaks remain. Neatly spoon the batter into the prepared ramekins. Bake the cakes for about 30 minutes, or until puffed and a toothpick inserted in the center comes out clean. 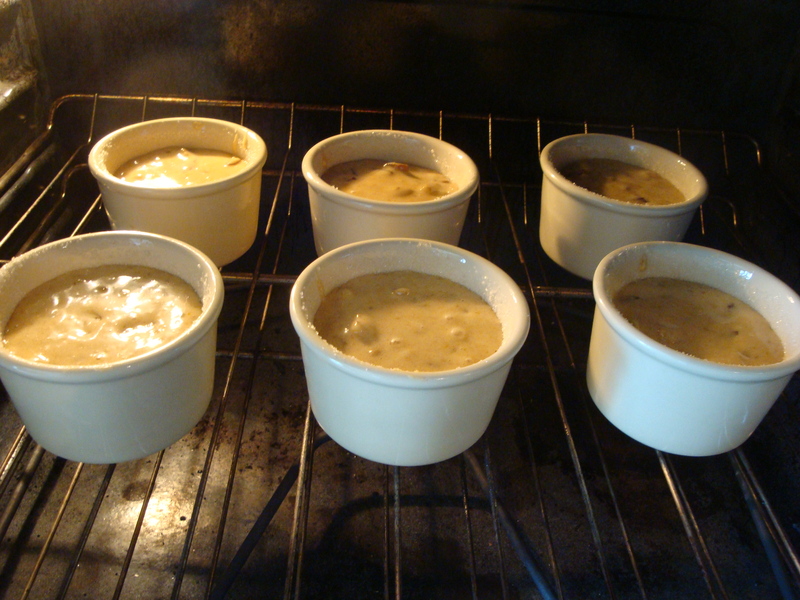 Let the cakes cool in the ramekins for 5 minutes. Run a thin knife around the sides to loosen the cakes and unmold them onto a rack. Serve warm or at room temperature.